The BCX ULTRA is our finest Instrument to date, offering many extraordinary features. The ULTRA has Radio Frequency (RF) in both glass tubes and electrodes that you can use simultaneously. The ray tubes produce a higher voltage while the electrodes produce a higher current. This combination produces even better results in your research on killing unwanted microbes. The greatest breakthrough in all our manufacturing years has been the spike wave. A close second is utilizing the RF carrier wave. All of our other features have been added to optimize to a fuller extent these 2 great pillars in devitalizing dangerous microbes. 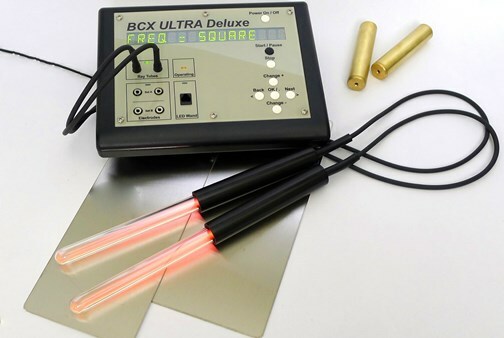 The BCX ULTRA offers many features other frequency devices do not. Dr. Rife used Ray tubes and so do we. Our hand held ray tubes are one very important feature allowing you to put the frequencies right where they are needed for maximum benefits. Feel free to watch the video below to learn more.